Having a nice weekend off? Google's moving your Customers. Props to Gizmodo for (I think) reporting it first, and how to turn it on, and how to turn it off. These new search options have been exposed here and there but are showing up this weekend for random Goggle users (happened to me; how about you? Please comment.). Don’t be distracted by holiday media staff (read: interns) thinking the change in button color is the news or that these changes are somehow related to Google Wave: they’re not. And if you accept at face value this underwhelming PR response, you’ll miss something that is going to change how much money you make in 2010 selling software. Having spent the day adopting these new options, they are too damn useful to ignore: I predict they are going to be the shortest Google beta in history, which means they are going to be your problem as a software vendor right quick. Any Time – that means your web content has to change. The game used to be that the older your site, the more quality inbound links, the closer to the top of Google’s results. Not no more, at least in our world. Old = Bad when it comes to what we sell. Why would care about software that isn’t in Google results in the Past Year? You don’t – and neither will your customers. Not Yet Visited. The first time a customer visits your site to judge your product will be the last time they visit your site. No second (have to include you when they search again) chances. What this means for your sales. Assess the Damage. Check Google – do you have Options? Ask around – Twitter works well for this. I’m launching a Twitter hashmark here: #gotgoogopt. Think. What does your software business now look like to the overwhelming majority of your prospective customers? Better? Worse? Invisible? Skip the first four steps of grief (denial, anger, bargaining, depression) and get on with deciding what you are going to do about it. Yes and no – Since March Google has been field testing various search options; since May the Wonder Wheel. It’s when everyone gets the full set of search options + Page Preview + Already Visited that how people use Google to find software changes. That’s starting to happen this weekend, and various Google watchers have speculated that the new Search Options + the new ranking algorithm Caffeine will be rolled out early next year. For startups and microISVs, what happens when your customers routinely search for new software (“recent”, “not visited”) with Page Preview on? You can wait as this becomes the norm – leaking customers all the way – or you can get at the front of the curve. Thank you for the notice, Bob – and I appreciate your take, but… I don’t know. 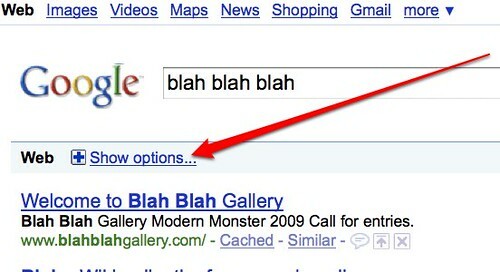 I don’t think typical Google users will ever click the “Show options…” link. And, if they do, their eyes will glaze over when they see that big list of options. It depends on the behavior of your target customers. Personally, I don’t see the wisdom in being too reactionary about it. But, awareness is definitely good. 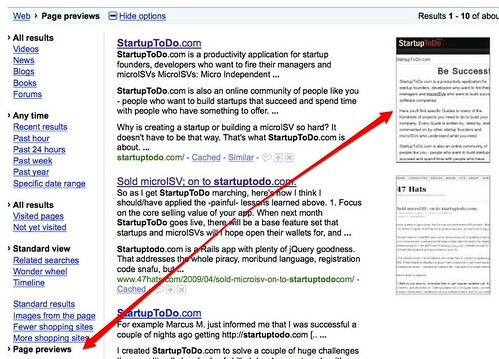 This should favor blogs — they change frequently (or are supposed to…). Great post, thanks for the heads-up. Seriously, no one, and I mean no one like every human being on the face of the planet no one, wants “old” software. If one click gets them “Recent” software, that has huge implications for some software vendors – perhaps you. Add to that the 1 click that turns on “ugly” vs. “pretty” and it’s something you’re going to have to address, unless Google decides these search features are too hard for their users – And that opinion would be diametrically opposite of their entire corporate ethos. Bottom line: which works for you: act on and gain sales or react to after losing sales? Personally, the most dangerous feature is the filtering “Visited Pages”. The good thing is that is not the default options. I did not nearly started to do SEO on my site and bang! all the rules change. It may not be an enormous change as Bob foresees, but it’s not negligible. I’m wondering if it’s better shelving Google for a while and targeting only Yahoo and Bing for the moment. Stray__Cat: Ignoring Google is like trying to ignore gravity. Nice in theory, hard in practice. Also note Google’s options are in response to where Bing is going….